Track Your Adventure Number Five: The Fastest Dirt Track in the South! | Sumter…In the Middle of Everything! ← Track Your Adventure Number Four: Fall for the Arts—This Summer! Here’s something I haven’t done in a while—shared a little piece of my personal history with you. When I bought my home in Sumter’s historic district some years back, I had the good fortune to meet several people who had clear memories of the place and could tell me about its history. One gentleman had spent his childhood there, and shared that his dad was an avid stock car racer. He reminisced about “Old Blue,” the Ford that their family kept in the back yard, a car they had raced at the Sumter Speedway until it came apart. From the smile on his face, those were fond memories, indeed. For more than 50 years, Sumter Speedway has provided highly competitive racing entertainment to Southern stock car racing fans. 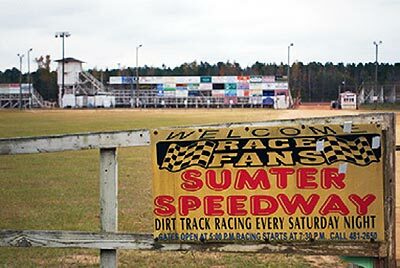 From its origins in 1956 as a converted cow pasture, Sumter Speedway has become a tradition among stock car racing fans from all over the area. It moved to its present location in 1957, and the 3/8 mile oval clay track has been a center of racing excitement ever since. According to its website, the Sumter Speedway is “proud to be a part of Dirt Track Racing, and is committed to maintaining the high standards of competition for which we are known.” In keeping with those standards, the track has been graced with such legends as Ralph Earnhardt, David Pearson, Ned Jarrett, Doug Yates, Richard Petty, Lee Petty, Junior Johnson, Rex White and Buck Baker. Racing classes include Extreme 4, Stock 4, Stock V8, Super Street, and Late Models. Special events include V8 Sprints and Monster Minis. 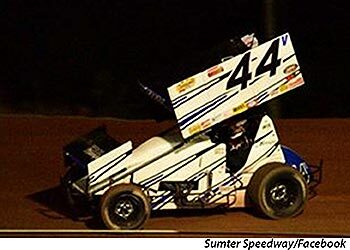 In 2015, the Sumter Speedway became a member of the Southeastern Crate Association. And if you have the need for speed, you can become a driver! Check out Sumter Speedway on Facebook for racing details. For more information, visit the Sumter Speedway website or call (803) 481-2650. The Speedway is located at 3150 Wedgefield Road in Sumter. Head for the “Fastest Dirt Track in the South,” get your passport stamped, and join in on some nonstop action! This entry was posted in Sumter, South Carolina, Visit Sumter SC and tagged dirt track, Facebook, military discount, outdoor recreation, passport, race, racing, SC, South Carolina, sports, stock car racing, Sumter, Sumter Speedway, suspense, Track Your Adventure, Wedgefield. Bookmark the permalink.